I posted this tip at AUGI forums a time ago. Here is the way I did an elliptical helix in 3D: Create a helix with the new Helix command. Explode the helix. Make a block of it. Insert it with different x and y scale. Explode it. Sweep it. and it worked on my PC for a while but then stopped working one day and I could not get it to work again. Adobe support confirmed to me that it was fixed in Acrobat 7.0.7 and that explained why it worked on some PC's but not on all. I had during the time tried installing older versions like Acrobat 5.0 and Acrobat 6.0 for other testing purposes and somehow that broke the fix even for 7.0.7 after a while. What helped was to completely uninstall every Adobe Acrobat and Acrobat Reader and clean up the registry. I still get a dialog box saying "WARNING! A script has requested to print an Acrobat file. This could print an entire document. Do you want to proceed printing?" There is a checkbox to make this not show up but in versions before 7.0.7 it just made the application not print the PDF's at all. So finally I got to know why this happened. before launch of Reader so that the dialog is not displayed. Setting it to 0 will make Reader to show it again. Something that is more irritating and that I've not found an easy solution for (let me know if you find it) is that you cannot add a new command to the PDF extension. Try Tools>Folder Options>File Types>Advanced on the PDF and add a new action. Now right click on a PDF and see that it's not there. Go back and try to edit it. Not possible. I suspect that it's the PDF shell extension file pdfshell.dll that does this. Not kind at all. You might as well run into this and I hope these notes can get help some of you.
' This will set all empty values to chr(160) in the active sheet set.
' loop through all the sheets. propname = "10-Last Revision GNETA"
' This will check the active sheet set.
' "Sheet number" is overriding the "01-Document Number"
' "Sheet title" is overriding the "03-Document Title"
dxfCode(0) = 1: dxfData(0) = "First Value"
dxfCode(1) = 2: dxfData(1) = "Second Value"
I have received the information that Baxter has won the ISPE Facility of the year award 2006! Pharmadule has provided the production facility which was the most important part of the project and we also made the entry proposal in Baxter's name. "The reason for Baxter/Pharmadule winning was innovation - there were two other facilities that were really awesome but our modular approach was the innovation they thought has made the best contribution to the pharmaceutical industry this year when it comes to production facilities." - Henrik Cornell M.Sc., Senior Vice President. I was the CAD Manager at Pharmadule Emtunga on this very successful project that started about two years ago. AutoCAD (at that time 2004 and later 2005) was the 3D CAD platform using Architectural Desktop (2004-2005) for the building, Rebis Structural and later ProSteel 3D for the steel structure, MagiCAD HPV for HVAC and UtilityPiping, MagiCAD El for Electrical, Instrumentation and Telecommunication, Rebis AutoPLANT for Process Piping and NavisWorks that was used for the 3D coordination and clash checking. 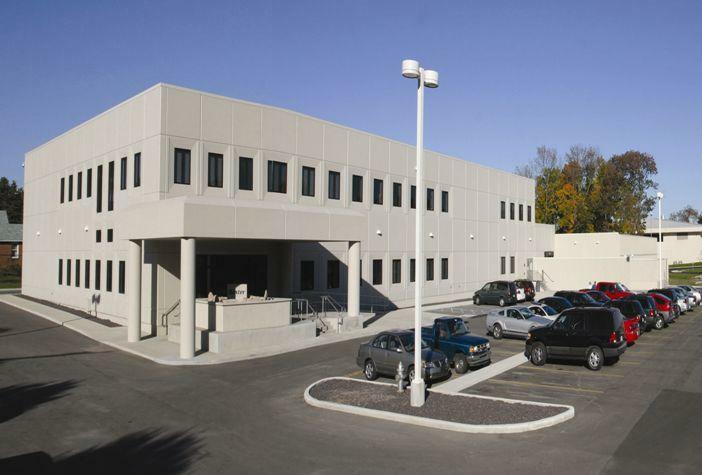 Below is a link to the official website of the ISPE Facility of the Year ward. I hope I can squeeze in some time to try the Vespa Beta that Shaan just blogged about. I had the chance to try it at AU and it looked promising. Let's see... What is the answer Shaan? "Which in the above is hand drawn and which is by computer?" I cannot tell. I just read Robin Capper's 2007: A ADT/ABS Space Odyssey that describes the new unified space object. This is one of the major reasons why you should upgrade to ADT 2007. To be able to create spaces for all rooms in a drawing within seconds and to have the spaces associated with the bounding walls and objects is a real time saver. Visual Styles in AutoCAD/Architectural Desktop includes a video showing what Visual Styles is about. A new blog BIMology by Tomislav Zigo starts with a post about Multi Line Schedule Tag in ADT 2007. Matt Dillon also has a fair post about his Position on "Revit vs. ADT" or was it ADT vs. Revit. It's not specific about ADT 2007 but worth reading anyway. I agree that ADT is more than only AutoCAD for Architects. If you want to know about the great Enhanced Property Data Features in ADT 2007 David Koch has posted 5 parts about it. Let's see if more is coming about it. I have also a post on the Scheduling Enhancements in ADT 2007. And as the last tip the Palette Auto-hide Speed freeware is working great in AutoCAD 2007 and ADT 2007 as well. Do I recommend upgrading to ADT 2007? Sure I do. But as always it's really up to how you use ADT and your environment and other factors. Remember that it's a new DWG format so you will not be able to use the ADT objects once saved in 2007 in older versions. DWG TrueView is available now. It's based on AutoCAD 2007. Get it at http://www.autodesk.com/dwgtrueview. It's free by the way but nothing is said on the file size of the download. It's 119 MB. I wonder what happens if I select "No thanks, I do not want to receive email updates from Autodesk." If I previously have selected Yes will my email now be removed? Notice also that "An authorized Autodesk reseller partner will contact you..."
Pharmadule (where I work as CAD Manager), Bosch and BOC Edwards are this year organizing the Third Annual Aseptic Technology Symposium in the US. This year Pharmadule is the main sponsor of the event that will take place in South San Francisco, CA May 17-19. BOC Edwards and BOSCH are co-sponsors this year. Contact the Event Manager by clicking on the logo below to get official invitation and registration kit. By trial and error I early found working in Visual Studio 2005/VB.NET that I needed to add the working folder (C:\Program Files\AutoCAD 2007) to the Working directory in Properties>Debug>Start Options. There are also a couple of other solutions to the problem that is triggered because acmgd.dll is now demand loaded at startup by default. Or don't copy acmgd to the debug/bin folder local. Change the Copy Local property for admgd.dll to False. By the way observe that you now can use edit and continue in VB.NET 2005 even when debuging a dll loaded in AutoCAD. It's great! To make it easier for those needing to work with older file formats of DWG files you have been able to automatically save to older versions. Now the Wblock command also respects this setting. It's also possible to manually specify the file type in Wblock (Write Block) using the browse for file name and path dialog box. The setting is available at Tools>Options>Open and Save>Save as. When reference editing a drawing it keeps the version of the xreffed drawing. You will get this dialog box message if you Refedit (reference edit) something other than a 2007 DWG: "The Xref selected references a previous drawing file format. Edits saved back to the Xref file will be in the release format of the referenced drawing file." These are good news for companies that might not be able to upgrade all users to AutoCAD 2007 at the same time and having to use older versions during a transition time. Hotfix - New Features Workshop Update - This hotfix provides some updated content in the New Features Workshop. Something that is not yet in the Readme is that you might need to do this. Right click on the file acad_nfw.chm after downloaded and select Properties. Press the button Unblock. "Security: This file came from another computer and might be blocked to help protect this computer." Hotfix - Autodesk Activation Update - After you activate and then restart your product, you receive error 0.1.0011 or 11.1.6011 and are required to reactivate. This problem can occur for Autodesk's 2006 & 2007-based products on computers with SATA Raid controllers. Important: If this update is applied to a computer that does not have a SATA Raid controller, the license on that computer will be broken. You will need to reactivate the product to repair the license. When you first start AutoCAD 2007 some dialog boxes shows up to help you to easier learn new features. Without looking to much you simply check the checkbox for "Don't show me this again". Later (seconds or days) you want to see this dialogbox again. Here are some ways. One way that restores many is to check the "Show all warning messages" checkbox in Tools>Options>System. Another one is to reset the profile completely using Tools>Options>Profiles>Reset. The following tips requires that you are familiar with the registry. The first thing that comes up is a dialog box Migrate Custom Settings. 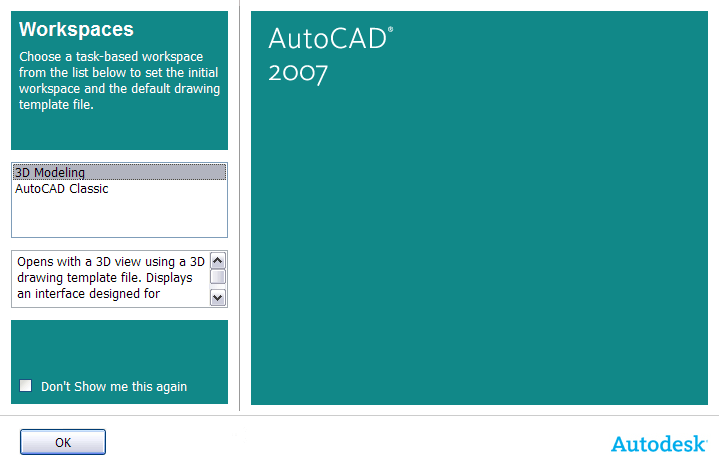 A previous version of AutoCAD (version 2000, 2000i, 2002, 2004, 2005 or 2006) is installed on this system. 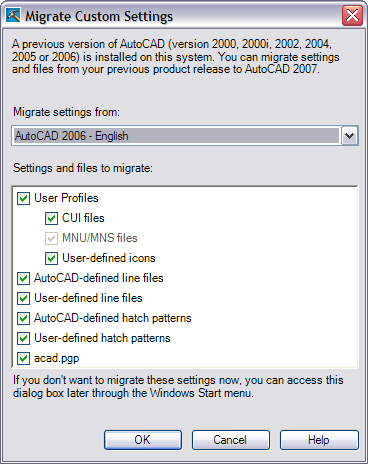 You can migrate settings and files from your previous product release to AutoCAD 2007. When you install AutoCAD you can select if you want this feature to be installed or not. If you press Cancel in the Migration dialog box the value will be set to 2. If you change the AutoMigrate value to 1 (AutoCAD has to be closed) the Migration will start again next time you start AutoCAD. The second thing that comes up is a dialog box about Workspaces that ask you to "Choose a task-based workspace from the list below to set the initial workspace and the default drawing template file." If you don't want to see this dialog box again it's saved to the registry and is saved to the profile. 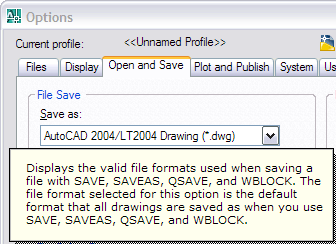 AutoCAD 2007 above is the name of the profile. If you want to see this dialog box you should take the value for MoreHideWarningDialogs and subtract 2000 from it. Observe that 2000 is hexadecimal. Selection Preview Cycling comes up if you for example holds down CTRL and selects a line. 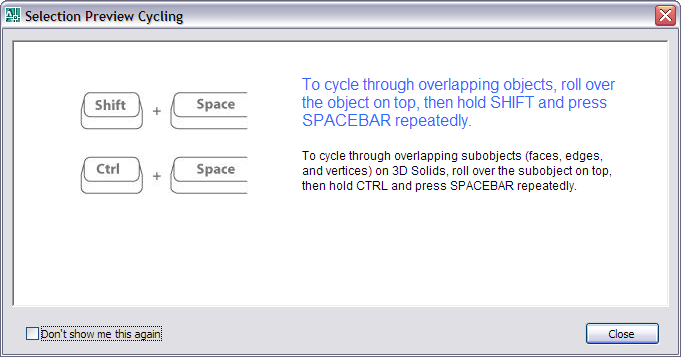 It says: "To cycle through overlapping objects, roll over the object on top, then hold SHIFT and press SPACEBAR repeatedly. To cycle through overlapping subobjects (faces, edges, and vertices) on 3D Solids, roll over the subobject on top, then hold CTRL and press SPACEBAR repeatedly." If you don't want to see this one 200 is added to the MoreHideWarningDialogs value. 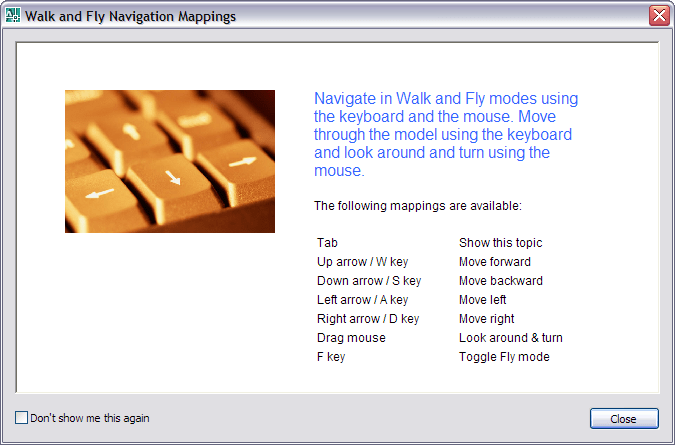 Walk and Fly Navigation Settings has the value 1000. These are just some of the values for MoreHideWarningDialogs. When you find a new one you wonder about or know about just add a comment to this post. If changes are made to MoreHideWarningDialogs in the registry the profile must not be current or active. Either close AutoCAD or change to another profile temporary. Eric Stover, AutoCAD Product Manager explains why in the Discussion Groups. "First, we look at a variety of factors when planning the next release. We also have a 'live' roadmap for the next 3 releases - a roadmap which constantly gets updated along the way due to changing customer requirements, new AUGI wishlist, new O/S parameters, our own vertical product requirements, to name a few of the variables." ... read more here. 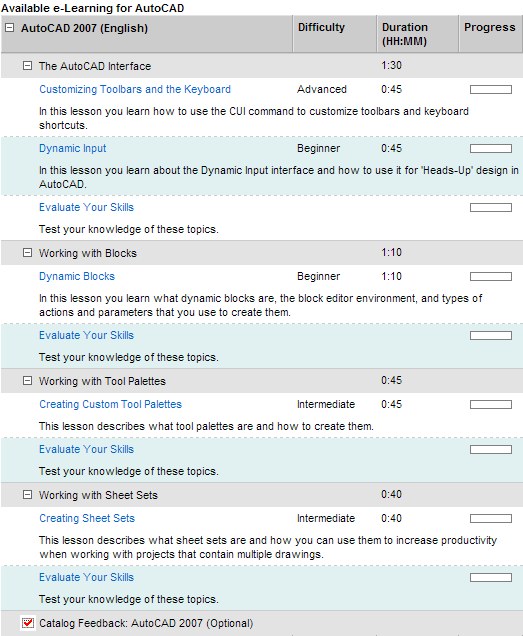 I noticed that e-Learning for AutoCAD 2007 now is available. It's free for subscription customers. Not so much about the new stuff though. It's more of an update of the previous lessons. But for some users it can be a great start to get familiar with the the features below.